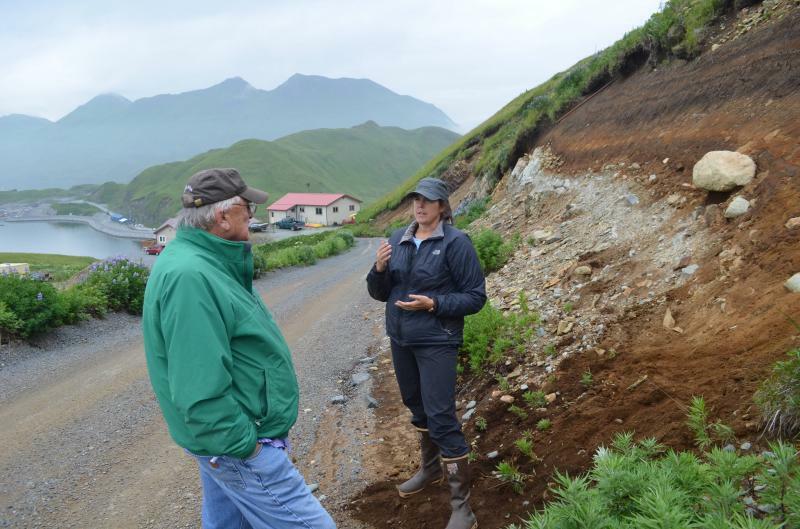 AVO geologists Janet Schaefer, Jessica Larsen, and Jim Vallance are on Unalaska Island, staying in Unalaska / Dutch Harbor (one of the most productive fishing ports in the world), studying the geology of Makushin volcano. Makushin is an active volcano and last produced a small eruption in 1995. More information on Makushin here. Jessica is sending daily notes back from the field - pictures will follow when she has a more robust internet connection. 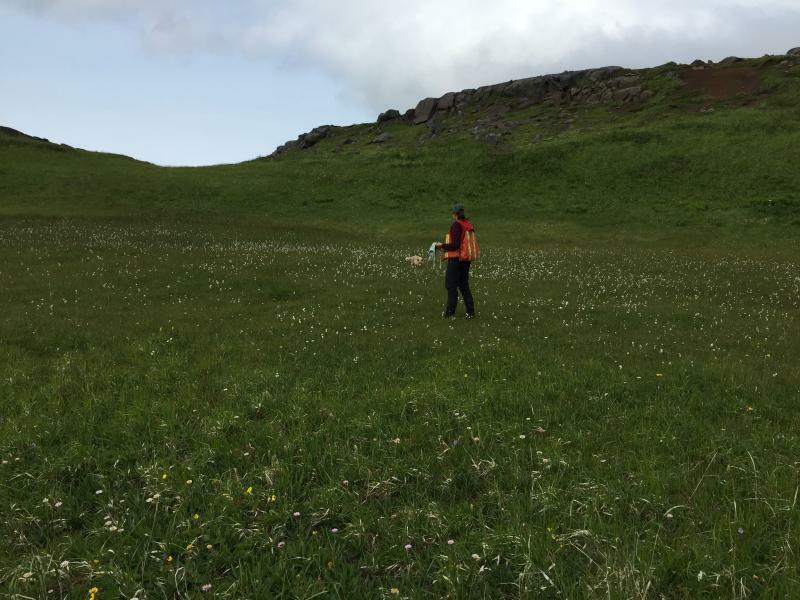 We worked around Dutch Harbor and Unalaska today, revisiting a few outcrops with deposits from three of the larger Makushin eruptions that happened between about 9000 and 8000 years ago. We visited three outcrops: the first on top of Haystack hill, the second near the intersection of Dora and Driftwood roads, and the third runs alongside the runway at the airport. 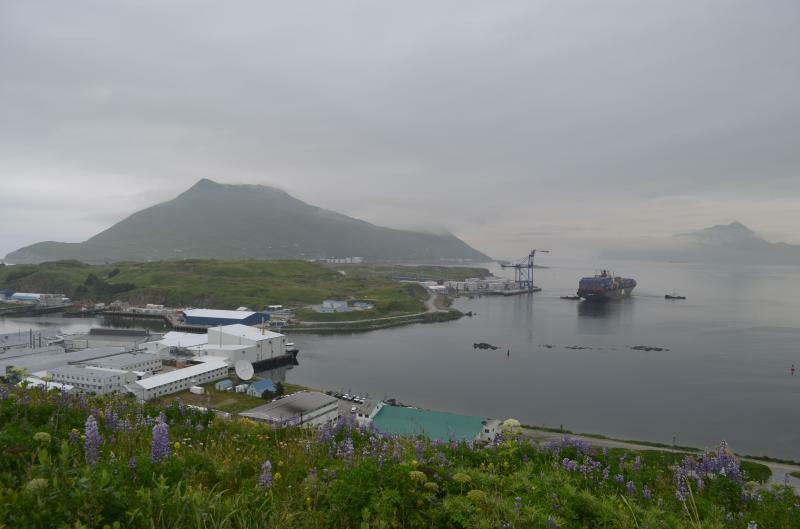 These three eruptions deposited up to ~20 centimeters of ash throughout the Dutch Harbor area. 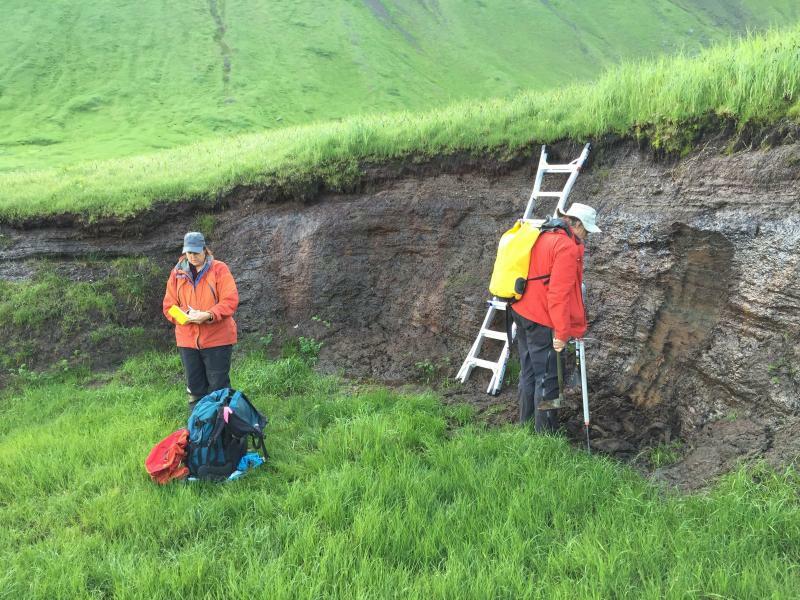 Although these deposits may seem "old", they are quite young in geologic age and we need to learn more about them in order to have a more complete assessment of volcanic hazards for the Unalaska region. Our helicopter arrived this morning with pilot Mike Brandeau from Pathfinder Aviation (Homer, AK) at about 930 AM. The weather today is not great - pretty windy and gusty, though the cloud ceiling has been pretty good. 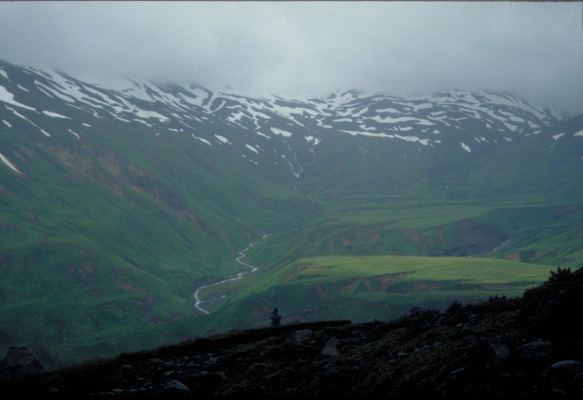 We got our pilot situated with lodging and food and headed out to see if we could get to some outcrops up by Makushin. We took off in the helicopter at about 1130 am heading for a valley due north of the Makushin summit where there are thick deposits from the caldera-forming eruption (about 9000 years ago). We call this valley the "waterfall" valley because there is a big waterfall at its head. The deposits there are thick pyroclastic flows. Our goals for this section include sampling the thick pyroclastic flow deposits for a detailed assessment of the geochemistry of the magmas involved in this eruption, additional work verifying the stratigraphy, physical volcanology and timing of each of these large eruptions, and characterizing the number, chemistry, and thicknesses of recent tephra deposits from Makushin within the past few thousand years for more eruption history information. After heading out from Dutch Harbor airport, the wind really picked up and the ceilings got worse. We flew up Makushin valley and then down the Driftwood valley to see if we could scoot around the coast towards the "waterfall valley". It was pretty windy, gusty, and lower ceilings - just too bad to go much further so we turned around. Today was a full day for AVO geologists working at Makushin. But a funny thing happened at the end of the day - a fox tried to run off with my wool hat! 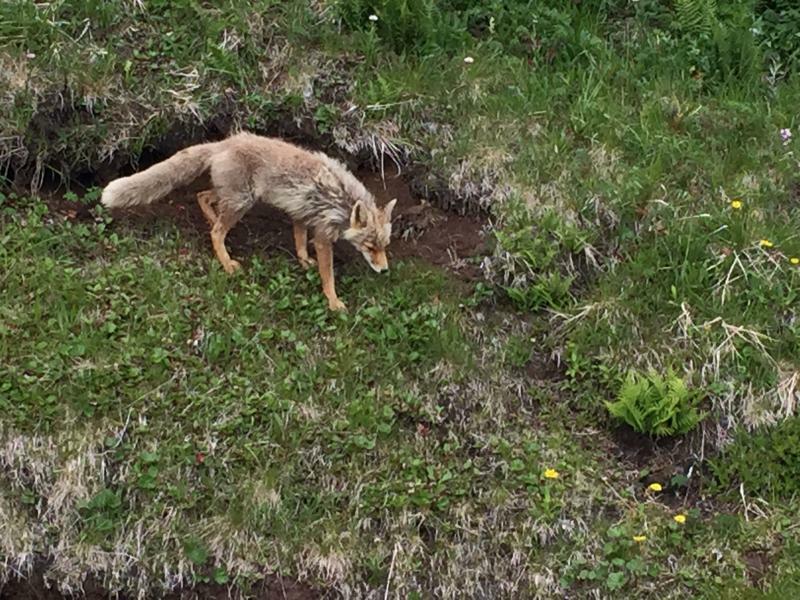 We were working at the last outcrop of the day and I left my wool hat maybe 10 feet away from us at the base of the bluff and a fox came up really quietly. He sniffed around my hat and shovel and then grabbed the hat string and took off with it! He was stealing my hat! So Janet and I jumped up and Janet chased him and he dropped the hat. He almost got away with it! In geology work for the day, the geologists and pilot Mike headed out to the airport a little after 9 am, first flying to a site to the northeast of the volcano. This site has outcrops of the three early Holocene eruptions (caldera-forming, Nateekin, and Driftwood) as well as numerous tephra (volcanic ash) deposits interlayered with organic-rich peat, which is good for obtaining radiocarbon (C14) dates to provide age estimates for the ash layers. Janet Schaefer collected 14 peat samples for C14 dating and 23 tephra samples from a peat cliff. The cliff is about 10 feet high but the vertical outcrop makes it difficult to sample each of the tephra layers. So, Janet brought out a folding ladder that proved quite useful for access to all tephra and peat layers. Janet and Jessica Larsen will collect chemistry from the volcanic glasses to study the composition of the melt phase from Makushin magmas through time, to compare with the whole rock chemistry data collected by the group. These analyses will also be used with prior data collected by University of Alaska Fairbanks student Kirby Bean in the mid 1990â€™s to provide an improved understanding of the eruptive history of the volcano within the past several thousand years. It was not the best weather when we woke up this morning; low ceilings and rain that turned quickly to fog. Pilot Mike took a break while Janet, Jim and Jessica went to another outcrop just above Captains Bay â€“ which is a very busy fishing dock area. We reviewed the deposits there and collected additional samples of the early Holocene eruptions for glass chemistry analyses. At about noon, the weather cleared up so we headed out with the helicopter to outcrops high up the Makushin valley on the east side of the volcano. 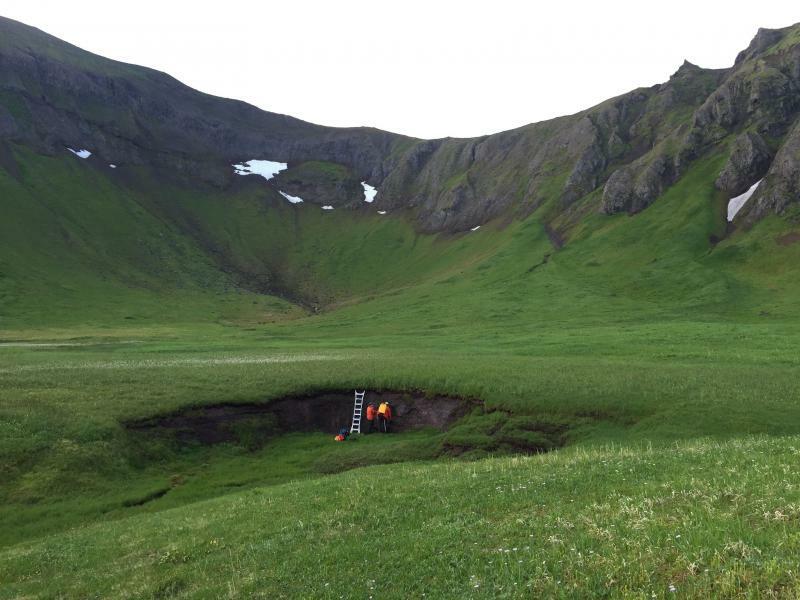 Our goal was to continue sampling the early Holocene caldera-forming eruption (CFE) and younger tephra deposits. We landed on a plateau created by thick CFE pyroclastic flow deposits. Janet traversed to the south side of the plateau where she described and sampled 25 individual ash layers over the course of several hours. It was very muddy work! Jessica and Jim carefully climbed down a grassy slope to gain access to the thick CFE pyroclastic flow deposits. Jim located the base of the unit and helped Jessica safely sample on the way back up. The slope was a little steep in places so working in pairs on this outcrop was important for safety. Altogether, Jessica and Jim collected 7 samples at approximately 10 meter intervals, comprising most of the 60 meter thick deposits. It can be tough work to hike back up a steep slope carrying big volcanic rock samples! These samples will be analyzed for whole rock geochemistry. Together with the rest of the samples, they will allow us to better understand the geochemistry of the magmas involved in the CFE eruption, and the timing of when different composition magmas erupted during this event. We then headed for a side valley to the south of Makushin valley to look for evidence of where the CFE pyroclastic flow traveled when it was deposited, and to look for the Nateekin unit and Driftwood pumice. We stopped at two locations in this valley â€“ one down lower where we found the CFE pyroclastic flow deposits with Nateekin and Driftwood above and another on a terrace higher up above the valley. These two locations allowed us to observe how the CFE pyroclastic flow traveled when it was deposited in the early Holocene. The flow traveled over a ridge and then flowed upstream to the south into this valley where it ponded. Before heading back to town for the night, Janet wanted to fly south into the valley to the west of Captainâ€™s Bay to look for another tephra outcrop, but clouds and wind prevented us from getting there so we turned back. Weather was again poor this morning when we got together with our pilot Mike. We decided to set off anyway and see if we could get to a few outcrops on the north and west flanks of the volcano. Those sectors have been very difficult to get to via helicopter during fieldwork at Makushin. 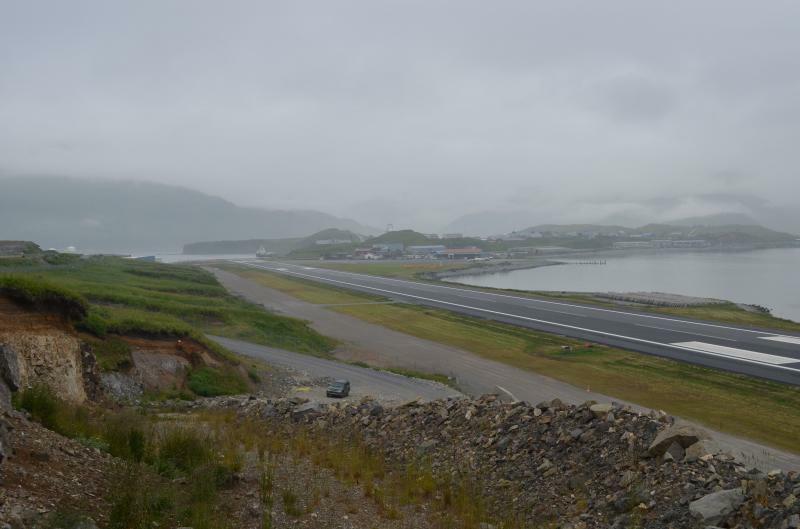 The weather on that side of Unalaska Island has always been difficult - windy, or foggy, or both. Today was no exception. We were able to reach the "waterfall" valley that extends to the north away from Makushin's summit, but had to stay low in elevation because of fog in the area. Unfortunately the weather did not allow us to go further west, or high enough in elevation to reach some of our remaining targets. We also spent the day together as a group with the helicopter because of the unsettled conditions. It's best not to split up and scatter to different locations when the weather is questionable. We were able to collect samples and study the stratigraphy of all of the young and older Holocene eruption deposits in two sites in the valley this morning but then were chased out by lowering fog in the early afternoon. Mike next flew us back to the east to a high valley west of Driftwood valley. 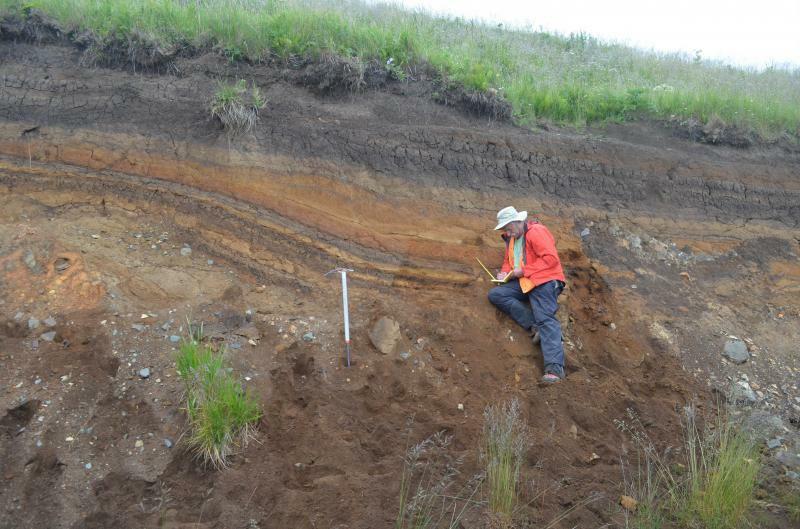 Deposits from the Driftwood eruption are especially thick in this sector of the volcano. We were able to work there for a couple of hours before the fog again chased us out to lower elevations. We studied mostly the same eruption deposits there, including 2+ meter thick pumice fall deposits from the Driftwood eruption. This eruption produced a very distinctive layer filled with tan to light orange colored, vesicle rich, "inflated" pumice clasts that form very thick deposits in the Driftwood valley - thus it was given the name Driftwood pumice by AVO geologists who made the geologic map of Makushin volcano in the 1990's. Deposits like this are very satisfying to geologists. They provide nice, large pumice fragments for geochemical and petrographic analyses. They also provide a distinct layer to use as a "marker bed" when working in the field. 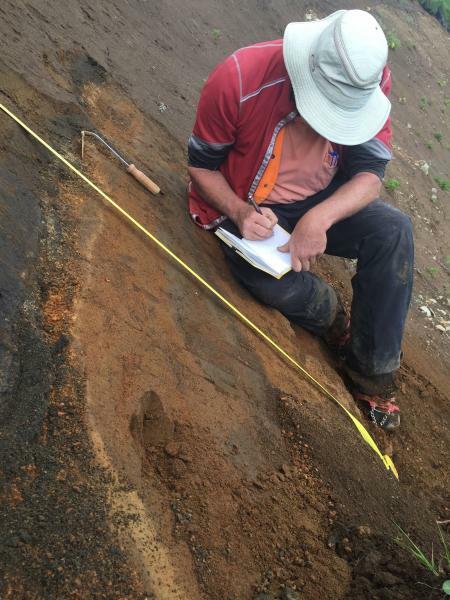 Marker beds help geologists place time markers in a stratigraphic section containing multiple and sometimes very complicated histories of many eruptions. They help us "know where we are" within a section even when other layers are confusing or not what we expect. We visited one more outcrop on a bench at the end of what we call the "lava ramp" - a plateau higher up in the Driftwood valley created by older, pre-Holocene lava flows. We stayed at this location for about an hour sampling and describing the stratigraphy until the fog came down again and we had to leave before getting socked in. We made a last attempt to visit a site farther away from Makushin, up the valley leading to Captain's Bay but in the few minutes after Mike landed, the fog came down a little too low and so we made the decision to call it a day. It seemed like the fog was chasing us around all day long. By that time, all of us except Mike were soaked because of the steady rain falling all day long so it was a good time to quit work for the day.